Firstly, I want to credit my blogging friend Steven at Ordinary Handsome for graciously giving me permission to paint this amazing photo. I’ve (very) loosely interpreted it, and I hope you all enjoy it. Thanks again, Steven! I also want to credit another blogging friend, Debi Riley, for her gracious words of wisdom on countless occasions. 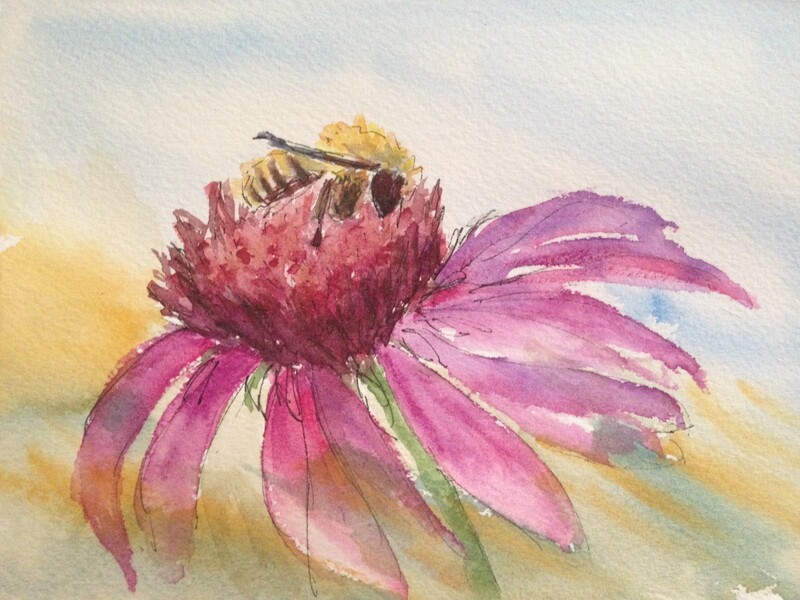 Her blog is chock full of watercolor lessons for beginners, and Debi, if you ever write an instructional book, I’ll be first in line to buy it! Thank you. I think my July watercolor experiment was a success. I feel like I’m finally starting to find my style and my footing in the medium. Loose and almost semi-abstract(?) is, I believe, where I fit, and how I’d like to interpret nature in my work. I wish you and yours a joyful and peaceful weekend of buzzing around, or not…..as suits you best. Peace. Beautiful wispy flower. Love this one. Thank you, Julie. I had wondered if it was a bit tooo loose. lol. I’m glad you like it. I’m really glad you like it, Steven! To be honest, I’ve done this photo three times now, and I could keep going! That’s never happened to me with any photo! Thank you very kindly!! I may take you up on that, as you have tons of great ones to choose from! You’ve made me stop and think because I feel exactly the same. For some reason I’m determined to work in watercolour. It frustrates and annoys me and I just keep crawling back for more! The thought of trying oils or other media really doesn’t appeal at all for some reason. I do enjoy lots of other media, but no other paint calls at all. I have zero desire to try oil and acrylic really doesn’t make want to explore it either. So I guess we don’t have to be “a natural” at the medium we focus on, then? Is anyone a stone-cold watercolor natural? There’s always a learning curve, right? I just have no clue, and would really like to know! Yes you’re right, I like pencil and ink etc but if I’m adding colour then I just wouldn’t think of anything other than watercolour. I think the learning curve is steepest for drawing, composition, values etc and this is common to all media. Watercolour has it’s own little quirks that you have to know about but someone who is already brilliant at oils say would get up to speed with watercolour quicker than a total beginner. I think using watercolour to learn composition, perspective, etc is more difficult because it doesn’t tolerate mistakes. If you were learning in acrylic then you could just keep going over and over the same bit until you got it right. Very true. Thanks, Nicola. I love the conversations here at WP. Great points. Another smile to start my morning. Ok, still trying to understand, sorry I keep going on lol…..natural and easy is good. Natural, yes, I’ve always felt that way, easy though? Using Arches paper definitely made it a TON easier, by a mile. But easy? I don’t think so, for me. Colored pencil was much easier but paint is totally different from pencils. It’s getting much easier now I’m doing it every day. This one was fairly easy (the flower), because I’ve done several coneflowers and I was purposely going for an interpretation vs being a slave to the photo (which for me is huge, btw)…..I don’t think I’d care too much if I wasn’t pretty determined to start another business in my non-busy season (May-Dec). Although that seems totally asinine when I consider how little I know. Sorry for the ramble, but I feel the need to sort this. Talking out loud is good. Business? Always a gamble. Go with what you really want to do. I think you always regret not following that dream, even if it doesn’t work out the way you want it to. True. Do you have plans for the grids? I love what you did with today’s post. All the white around the grid with the text added was pretty cool! Quite a finished look. And clean. Well I’m going to keep doing my beginning of the month/haiku inspired grid for sure. I’ve also done another embroidered one, I will post soon (working on how I want to hang it). And I do want to get back to the color explorations that I did in my 100-day project. Not ready yet though. Lol really, when I read this it sounded like me talking! Ha ha, we must have similar thoughts about the direction to go in with painting, just I feel nervous of myself ability, eek. I have to say it is an interesting thought about which medium, I began with coloured pencil ( for years and years) then decided I should grow up? Not sure why, I just thought people appreciate one of the three main mediums, I have changed my mind since that. I went onto acrylic, which I got on fine with, so then due to its limitations I tried oil, wow, really loved them, but in a small house and requiring places to store and dry each canvas before I could get onto the next step ( having 5 cats that seem to aim their paws at wet paint) so practically oil is hard for me to use, but leaves a lot of options for change, when you mix a colour, it is still available for use days/ weeks later( covered) it was not until man 2015 I began watercolour, having previously loathed it, now I am loving it, and experimenting with trying to find my style, and trying different techniques with it, plus using other mediums with it. Kerfe, I hate these new comment boxes, I always press send by mistake when I’m not done! I’m not sure what I was going to add, except that while focus is good in many ways, I think we should always be ready and open for something different and new. I agree. Maybe I should just make friends with confusion and indecision on this and keep following my gut. OMG! my new FAVE. you have come so far and have become such a gifted artist. Dance and fly girlfriend!! I know when I’ve found a medium when working with it gives me more joy than headaches. 😉 But I have than more than one favorite medium. I love ink, charcoal, chalk pastel, and watercolor. I can see and feel the joy in your watercolors! Great painting! I could see this one in a gallery. No joke. Awesome Laura, just keep painting. Your style is emerging beautifully. I think this is terrific and you’ve done well. It fees alive to me and I am impressed by how you vary the color. Thanks, Kirk! I was going for a wind through the field of flowers feeling. I think it might be better for the bee to be in motion too. And I def need more practice painting them! Thank you, Tori!!! I like this one too, which I can’t say about most of the stuff I make, so I’m glad you like it and more importantly, I’m glad it inspires YOU to make something beautiful!! Thanks so much, Lance. This one felt good to me. I was able to get down on paper what I was trying to say, this time. Thank you. I’m glad, Jill, and thank you! Color is the absolute best thing about art! Nice work I enjoy watching your progress. How do you know you have found your medium? I thought I had found it in colored pencil. I worked in colored pencil for 13 years..very realistic work. One day I stopped now I have been jumping around ever since and enjoying the ride. I guess keep your options open! Thanks Carmel! Sounds like great advice! Wow, I love colored pencil but detailed work would be so time consuming. How did you find the patience? Nice, Charlie, and thank you! I don’t think anyone ever stops learning watercolor. It’s a very cool challenge. :))). Thanks so much for your feedback!! Thanks so much, Debi! I think/hope I’m starting to find my style! I’m so glad you’re happy with it. I’d like to do the same one and keep improving it. Love the photo. I know the bee needs lots of work. Oh what a gorgeous painting Laura! Love the loose style and easy energy the flower has taken on. I’ve found my go-to medium in oil pastels, but love working underpaintings in acrylics and one day I’ve vowed to try painting a real scene in watercolor, acrylics and oil. Okay I can imagine how old I’ll be before I achieve that goal – but kidding aside I love OPs and the every day challenges they give me. Your flower is filled with technical know-how. Thanks, Mary! Sometimes they just work out that way. I had tried this photo three times already, and maybe all of that had something to do with how easily this one just flowed. It sure doesn’t always work out that way for me in WC, but when it does, it’s like magic. (It really does feel like a blessing of some kind, not something I did at all, when it does turn out, to be honest.) Thanks as always for your feedback! There is a lot in what you just wrote – awesome! Thanks, Rebecca! That does found like great advice! I always want more. You raise a great point. Do you have a favorite medium? You seem to work in so many so well. Thanks, Rebecca. I think it’s my left brain urge to label everything. Must stop. I’m enjoying painting more as I let go more. The freer, the better, for me it seems. Mood definitely plays a role and I’m finding the medium a wise teacher. I’m not much of an painter, sculptor, or really amazing sketcher, but I do like photography and loose sketching. I was super excited when I realized I could draw, but photography has always been a part of my life. I’m so happy you’ve found your medium! I love your pictures! *simply whatever you want to try again and again. Thank you! That’s a great one! The happy place with challenge and easy both. Really great. Thank you, BB, and I’m glad you like the painting. Hi Laura! I like where you are going with the niche you are seeking. I’ve been thinking that is where I want to be as well, so it is fun to find someone else thinking so. As to medium….what are your goals? Some “experts” will tell you that there is a hierarchy in terms of sales, with oil paint commanding the highest prices, and watercolor coming in lower. However, many feel (myself included) that watercolor is so sparklingly beautiful it deserves higher prices. Also, it is a very difficult medium…that should count for something! For myself, I paint in the medium that brings me joy. I’ve heard the same, Melissa, and I’m stunned watercolor isn’t the top one. As to goals, I’d like to start a business, but the more research I do, the more I’m tempted to keep it as a hobby. I also feel I have art ADD, to some extent, so I’m trying to figure what mediums/subjects to put my focus. Do you ever struggle with this? I do. I have one toe in oil paint, because my preferred medium, acrylic, is really plastic and I’m having a hard time justifying that to myself. As nearly as I can tell the manufacture of it is pretty hard on the planet. I’ve found a source of environmentally friendly pigments I can mix with walnut oil…but that means switching and I’m having trouble with that! Oh, the dilemma! I really enjoy seeing your work. Don’t be afraid to follow your dream of starting a business. You can do it! 🙂 It’s true that it isn’t easy, but if it is a dream, then it is worth it. Thanks, Melissa; I appreciate your input. I have a small tax/accounting business, and boy, it’s much easier to make a go of it there – because people “need” what you are offering. Whole different ball game there. I always had a dream to have a business and now I have one, and realize the ups and downs that go with being self-employed. I would like to make art for a living, but I’m sure lots of people would! So we’ll see. Thanks for the encouragement. I love watercolor and I’m still learning! I also don’t limit myself to one medium either…what I learn in other art forms can be applied elsewhere 🙂 Keep painting and drawing! Thanks, Karen! Patience was never my strong suit. I feel like I wanna skip ahead and know exactly what medium and what subjects I should be working in and with. I realize that’s not what the art journey is about, but I just wanna have the answers lol. I don’t mind putting in the time and practice. I’ve seen that work I do in one place helps what I do elsewhere, but if I’m never going to be good at watercolor, for example, then I’d just like to put it aside and focus on something that I will be good at. My “day job” is accounting, and I think the left brain is just trying to run things, as usual. I really appreciate your input. I do enjoy it. I think you make a great point. I just wish my progress was faster. I feel like I’ll always be in love with it, but as you say, if I had to commit to it (and only it) for life, I’d get a divorce lol. Thank you so much, David! I totally agree with you – as in life, so in watercolor. I think you’ve put my feelings into words exactly. I do enjoy trying different mediums, but fell in love with watercolor first and it calls me loudest. Your stained glass painting was so inspiring; I enjoyed revisiting that post last night and browsing around in your blog. If I could paint like you, I’d probably not try anything else either! I’m glad you enjoyed my flower and bee. Ooh. I really like this flower.